Scott Eisen/Getty ImagesWaves crash over houses on Turner Rd. as a large coastal storm affects the area on March 2, 2018 in Scituate, Massachusetts. This describes the process in which a storm quickly gets stronger if its central surface pressure drops by at least 24 millibars in 24 hours and qualifies it as a bomb cyclone. “Bomb cyclone” is a real meteorological term but it describes strength, not potential damage. Even so, this storm is expected to cause heavy damage on the coast. It’s official: the bomb cyclone is back. The winter storm that the Weather Channel has dubbed “Riley” has been undergoing the rapid intensification process called “bombogenesis,” which means its central pressure is dropping quickly (an indicator of a storm’s strength). In this case, the nor’easter still appears to be intensifying, but the central surface pressure of the storm system has already dropped by at least 24 millibars (mb) in 24 hours, which means it is undergoing bombogenesis (or “explosive bombogenesis”) and qualifies it as a weather bomb or bomb cyclone. The term bomb cyclone dates back to a 1980 paper by Frederick Sanders and John Gyakum, which described the phenomenon as a “bomb.” That sounds dramatic, but it actually refers to an extratropical surface cyclone: a storm occurring outside of tropics, usually between 30 and 60 degrees latitude if it happens in the Northern Hemisphere, with a quickly-dropping central pressure. Central pressure is the measure of how much the atmosphere in the middle of a storm weighs, and it’s one of the key indicators of any cyclone’s intensity. The lower the air pressure in the middle of the storm, the more intense that cyclone is. Normal air pressure is about 1010 mb; when central pressure is lower than that, things become more turbulent, with more air movement and wind kicking up. 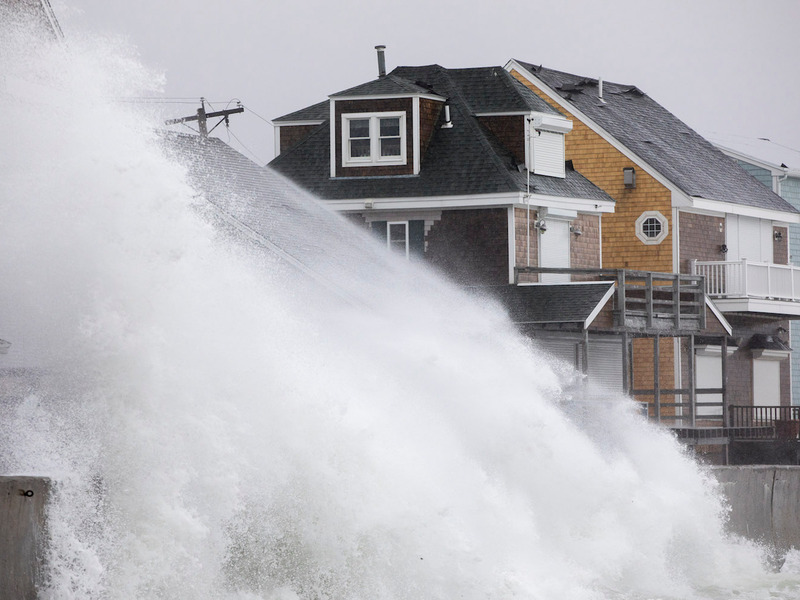 It’s not uncommon for nor’easter storms to undergo bombogenesis. It happens on average between 40 and 50 times in the Northern Hemisphere each year, according to meteorologist Ryan Maue. Despite the menacing terminology, the term “bomb cyclone” doesn’t have anything to do with potential damage. However, this particular nor’reaster looks like a bad one. Potentially record-setting moderate to major flooding is expected in Boston Friday and Saturday. Meanwhile, intense winds with close to hurricane-force gusts have been battering the East Coast to the point that the term #windmageddon started trending on Twitter.